I'm starting to realise the real issue with cloud computing is not one of security or whether we trust the likes of Google to [Mostly] Do No Evil, but whether under pressure the companies running such services will feel compelled to part with our information like the information parters they are. That last bit was fairly superfluous. 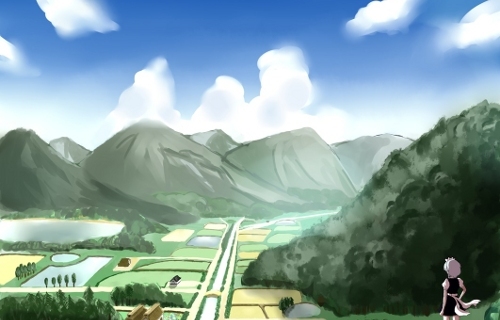 Beautiful cloudy landscape art by KONDO on Pixiv. I wish I could draw! In December last year I stopped using Gmail for anything serious. There were a combination of reasons, ranging from my desire to use PGP in most of my communications, to getting frustrated at the relatively slow speeds Gmail offered when using it with a desktop email client, to wanting to use my own domain and really zippy servers with Net Solutions that I already use to host dozens of my sites and projects. Yes, I'm aware all these problems could be technically overcome or tolerated if I just sucked it up. Fair enough, but I had my reasons. I also deleted my Facebook account, partly because I was fed up with the antics of a few people, but also that I felt what little value I derived from it (PR speak for "how much fun I had using it") was eclipsed by my distaste for what they were using my data for. I have no problem with using sites like Twitter, Gowalla, 4sq and Wikipedia precisely because I'm under no illusions of privacy. They're designed to allow us to broadcast our lives. This latest American federal subpoena targeted at Twitter for Wikileaks' supporter accounts exposes a real threat with using cloud computing applications. By having large numbers of users in one silo, sweeping and legally questionable requests can be made to access this information. Twitter were good online citizens for letting us know they were being asked for information, but it leads to the inevitable question: how many other online services were compelled to divulge information about their clients' data, and how many remained completely silent about doing so? Of course this isn't negating the real possibility that a police officer couldn't kick down your door and demand to take your computer systems to access information you have stored locally instead of the cloud, or for a court to do the same, but we're kidding ourselves if we think that would scale to the same numbers as easily as it would be to just commit to some serious ninja data mining on a server farm somewhere. For one thing, there'd be far fewer doors and much less kicking, which would mean more time for doughnuts. Mmm, doughnuts. My favourites are the ones you buy at mum and dad bakeries in Australia. Nobody in Singapore does a good doughnut, not even those expensive Japanese bakery places. I also think we're kidding ourselves if we think we can get away with not living in the cloud entirely, but for communications such as email and social networks I don't feel compelled to use any more, at least I ultimately get a say what happens to my data. At least then when I'm forced to give access to my laptop to a security official at an Australian airport, I can only blame myself for all the stuff they find, such as my detailed plans for a coffee cup that leaks hot drinks on people's hands so you have a chance to escape while they treat their burns. Genius, I tell you! Can you tell me how to make one? Sure! Just drop a mug onto the floor just hard enough for cracks to form, but not have it break. Wait, why am I telling you this? You didn't read any of this. None of it.